Loud, dry rattle; often prolonged. Description: Large head; long, heavy bill; crested. Male is bluish-gray above; white below; and has a thick bluish-gray breast band. Female is similar but has an additional rufous belly band below the bluish-gray one. Juvenile resembles adult but has rusty spotting in the breast band. Behavior: Nests are excavated in almost vertical earthen exposures in bluffs, road cuts, and eroded streambeds. Habitat: Found near various water bodies which support populations of fish, amphibians, and other aquatic life. Where in Nebraska: Common spring and fall migrant and summer resident across the state. Uncommon winter resident if open water is still available. Regular breeder. 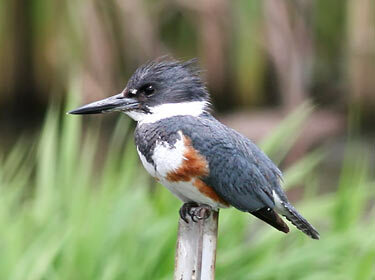 Fun Facts: In Belted Kingfishers, the female is “showier” than the male. She has two breast bands instead of one, one is blue and the other is rufous. 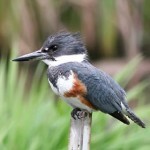 Additional Information: The only kingfisher seen in most of North America.